The blog party theme for this month is a very apt The Holiday Edition, as hosted by Stephanie. Towards the end of October until the first few days of the new year, everybody puts up with so much hustle and bustle and so many comings and goings. Families, relatives and friends, balikbayans (literally, to come back to the motherland, referring to Filipinos who migrated abroad and come back to the Philippines for a vacation) or OFWs (overseas Filipino workers) all schedule a trip to their provincial roots during the last quarter of the year due to several reasons, mainly, All Souls Day, Christmas and New Year. These events are all considered sacred obligations to pay respects to the old by dropping by their houses and to visit the resting places of ancestors. When there are many kith and kin, there must be more than enough food to munch on. Food that can be left on the table and picked on any time of the day - in the early morning which can double as breakfast, in-between breakfast and lunch, during the whole afternoon, and up until before sleeping time when conversation is non-stop and free-flowing. During these times, we go back to preparing local traditional foods, for the benefit of the out-of-towners, who miss food they grew up with. First one of these is the native tsokolate, hot chocolate from tablea, which are small, home-made chocolate lumps from cacao beans produced by the cacao trees in the backyard. This is appropriate for the cold mornings that signal the holiday season. It is traditionally sipped with forkfuls of the local suman, made from ansak-ket (malagkit na bigas, sticky rice) cooked in gata (coconut cream), rolled and wrapped in coconut leaves, then steamed. The suman is the perfect foil for the richness of the tsokolate, traditionally served in a demitasse to limit intake (but of course I've got my own huge mug!). In the afternoons, it is good to drink tsokolate with ensaymada, the local pastry favored around the country that I've read has been likened to a brioche. It is as fluffy as a croissant but is as soft as a chiffon, slathered with butter or margarine, then sprinkled with sugar. 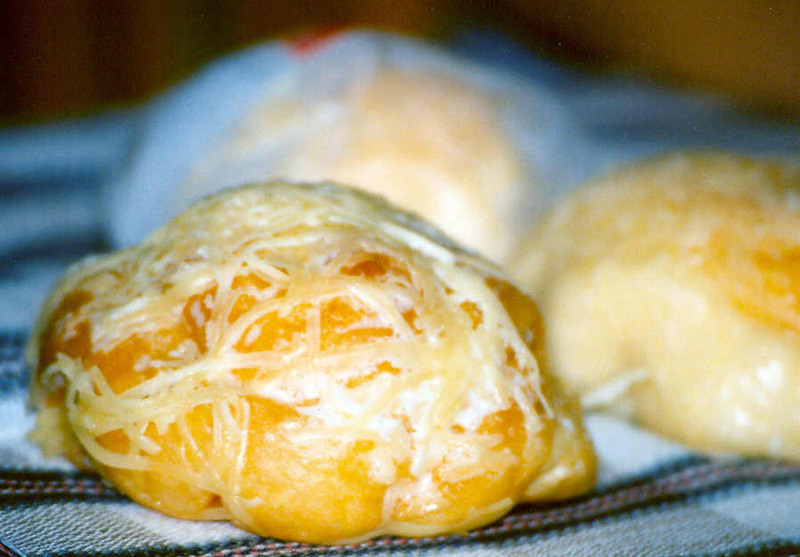 Nowadays it is common to have grated cheddar cheese or crumbled queso de bola (Edam cheese) on top. 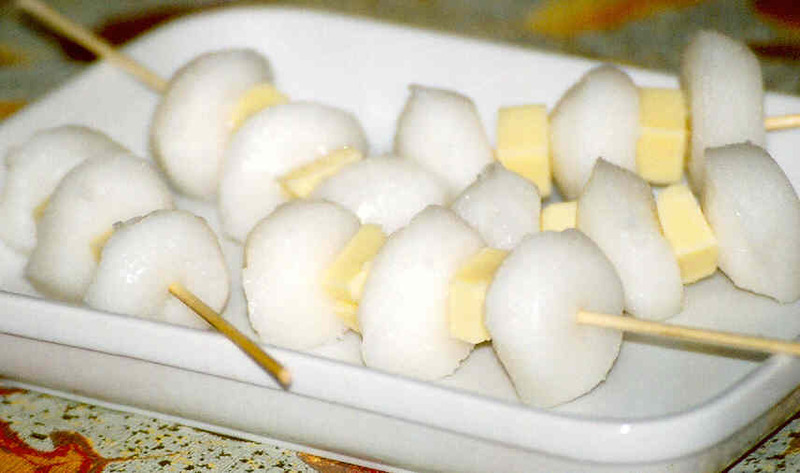 Then we have the indispensable puto from the town of Calasiao, those moist, sweet, semi-flat bite-sized balls made by steaming ground rice. It can be eaten anytime of the day, good with grated cheese or Cheez Whiz. This is our version of the American Pringles - once you pop, you can't stop! It can be served with toothpicks on the side, or as I invented, skewered on short kebab sticks with cheese cubes in-between. Latik is cooked during times when there are many people staying in the house. Due to the intensive labor involved in making the delicacy, big batches are prepared, which last about two to three days only, though it is usually gone before day three. It is ansak-ket cooked in gata, then spread with latik which is solidified raw molasses cooked again in gata, then baked in a primitive oven. When cooled, it is sliced into small rectangles, which would consist of a single serving. Of course, you are allowed to eat as many as you want, as you are wont to do because it is such a sweet rice cake, but one serving is very filling and enough to satisfy hunger pangs. Because these are traditional foods, the ingredients come from the agricultural lands, which are planted to coconut trees and palay, and sweetened with molasses coming from coconuts or sugar cane, also a local agricultural product. The cacao originated from Mexico, brought to Philippine shores during the Galleon Trade when the Philippines was a colony of Spain. 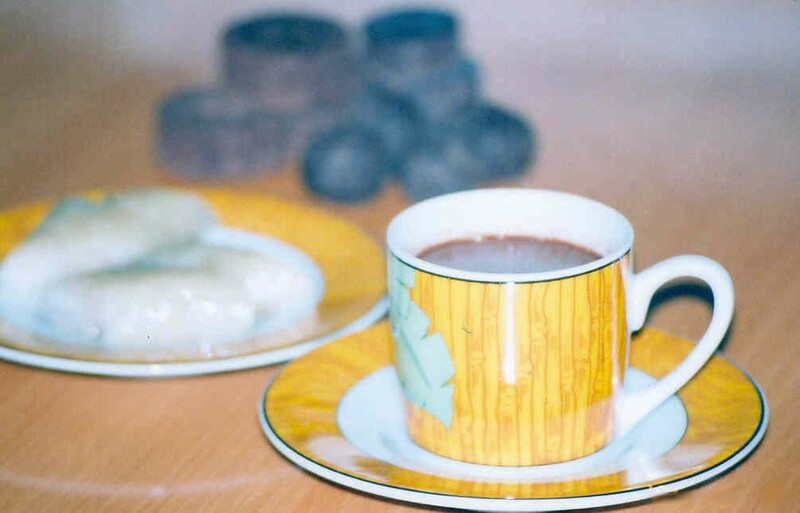 It was re-planted here with success, and the production of tsokolate, although small-scale and mostly for family use, has been adapted to suit the local cuisine. Here is what is served during parties and gatherings like this around the world. Wow, Kai...I have no idea what half those ingredients/dishes are, but everything sounds and looks fantastic! Thank you so much for joining this month's party, and for bringing such a wonderful tradition along for the ride. What a wonderful post, Kai! It was so nice to read about all these family traditions. Kai, that putu looks like something we have but we eat it with palm sugar and grated fresh coconut. Thanks for the lovely introduction to your traditional foods, I can see similarities with Malaysian food. 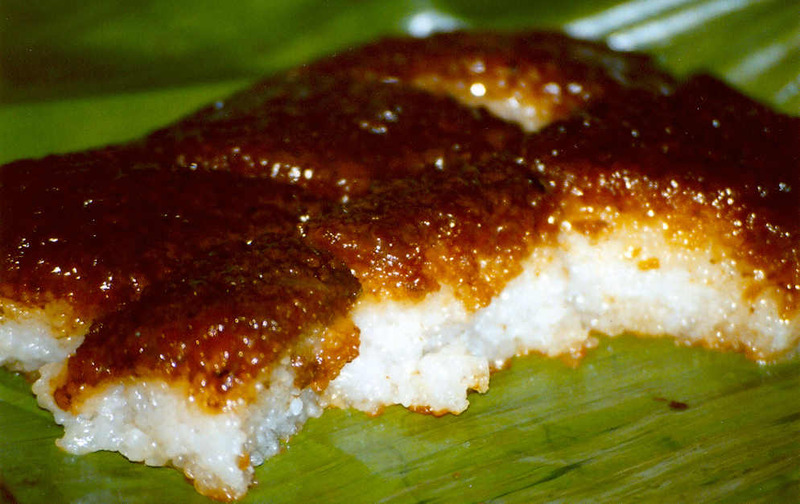 love those latik topped rice cakes! nice!